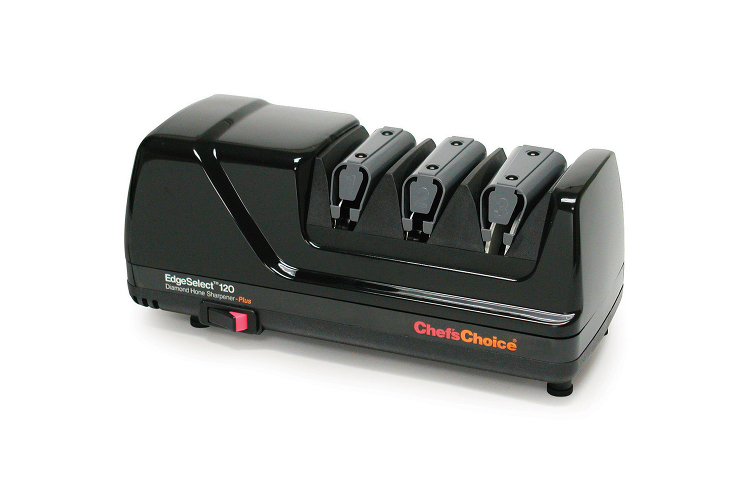 The Chef'sChoice® Diamond Home® EdgeSelect® Knife Sharpener Model 120 delivers fast results and highly durable edges for straight edge and serrated 20º knives. It is so easy to use, anyone can put astonishingly sharp, long-lasting edges on knives in seconds. You can select extremely sharp hair-splitting edges that slide smoothly and effortlessly through delicate foods or edges with varying amounts of "bite" for more demanding jobs, like cutting tough fibrous foods and meats. 100% fine diamond-coated conical disks in Stage 1 and Stage 2 form the first and second bevels of a durable, arch-shaped edge. In Stage 3, a revolutionary flexible stropping disk creates and ultra-sharp polished third bevel and cutting tip while polishing the first two bevels to form sharp cutting flutes that enhance the cutting action on both sides of the edge. Built-in high-precision elastomeric angle guides eliminate guesswork and ensure sharpness time after time. It's ruggedly built and backed by a limited 3-year warranty.